It was incredible for me to learn that the title of the founding father of South Africa as well as Cape Town, Jan Van Riebeek, was not the same man that we have come to learn to recognize via his Cape Town statue or as we have come to see him on our local paper currencies in the past. Tom Bulpin was a renowned author on Cape Town who unfortunately passed away two years ago. According to his research he discovered that the portrait always believed to be that of Jan van Riebeek, on which the face of the founder was modeled in later years, actually was the portrait of a Hollander by name of Bartholomeus Vermuyder. Jan van Riebeek we are told, was married to a lady whom we have got to know as Maria de la Quellerie. Firstly, this not 100% correct as he was married to Maria Quevellerius. Furthermore the lady whom we have go to know as Maria, via her statue on the Cape Town foreshore as well as her portrait, is just like her make believe husband not actually her. The statue WAS a copy from the relevant portrait that we have all got to know, however the portrait is of a lady by name of Catharina Kettingh who could well have been Vermuyden's mistress.. It is also interesting to note that according to the Dutch portrait specialist FGLO van Kretschman there is no known authentic portrait of Jan van Riebeek and his wife and that the portrait of Vermuyder and Kettingh are in the Ryks Museum in Amsterdam. Cape Town's main street, namely Adderley street, used to have many Hansom cabs lining its central pathway right up to the mid 1950's.These Hansom cabs came to Cape Town in 1849 after being imported by Sir Robert Stanford. The cab was drawn by a single horse and the original patent on these taxis of the 19th century was registered to Joseph Aloysius Hansom and was named "Mr.Hansom's patent safety cab" They were originally introduced onto the streets of London in 1834. Both the fare as well as the driver used to sit on the back axle. The question could be asked as to why the driver of the cab had to sit at the back of the cab and not in the front so as to have better control over the horse. Hansom cabs had their door on the rear. This led to large scale hitching onto the cab for a free ride and the cad was designed in such a way that the driver could see his passengers get in & out thus preventing this thievery from taking place. To prevent this from happening the driver always stood at the back of the cab. It is also told that the passengers would always complain if the drivers posterior could be seen during the journey. This was summarized by a line in a local newspaper which read " The superior in the interior should not see the posterior of the inferior on the exterior." Sadly the Hansom cab is no more to be seen in Cape Town. In 1906, the now demolished Baptist Church in Wale Street Cape Town was used as a law-court. Somebody who would not have cared to remember this was a certain Mr.Rorich. The reason for this was because he was the first person to be found speeding in a city street in Cape Town. He was travelling at a speed of 12 miles per hour in an 8 mile per hour zone. For the offence he was fine 2 Pounds which was a heck of a lot of money in those days. This case is clearly documented however in my opinion the question remains as to how the speed of 12 mph was correctly determined. In 1947 The British Royal family visited Cape Town, South Africa. The joint school board in Cape Town decided that it wanted to do something special to commemorate the event and the idea of a "living welcome" was decided on. The pupils or Ellerslie, Sea Point Boys High and Junior, Ellerton, Kings Road Primary and Camps Bay Primary were all put through their paces for the living welcome. Rehearsals took place on the Sea Point Junior School lawns. A piper cub airplane was flown by a local enthusiast during rehearsals so as to check that all looked right for the event. A site on Signal Hill was chosen. Footpaths were cut into the bushes of Signal Hill spelling the word WELCOME. The letters were 100ft long. On 17 February 1947 200o school children, all dressed in white, lined out the marked letters with the girls forming the letters W E L and the boys forming the balance C O M E. The family arrived in the battleship by name of Vanguard. On siting the "living WELCOME" a signal was given from the ship that it had seen the WELCOME sign from far and this caused all the children to thunderously cheer. The first contact by the people of Cape Town had been made with the Royal family. Up until the late 50's the carved paths of the words WELCOME could still be seen on Signal Hill, but alas today they are no more to be seen. The people of Cape Town however have never lost the wonderful sense of welcome that they have always had for foreign visitors to their shores. 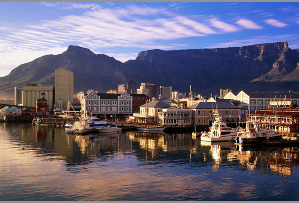 Cape Town is also known by South African's as the Mother City. At the same time of every one of us constantly using the phrase I wonder how many South Africans actually know where the phrase comes from? Well here is the answer. In the 1930's some unknown party wrote to the local cape Town newspaper claiming that Cape Town was the only city in South Africa that could justly call itself a metropolis. The public took to this description and because the word metropolis is derived from the Greek derivation of meter or metros meaning mother and polis meaning city, the nickname of "mother city" was born. Hence today we know our wonderful city as being "the mother city". Even more fascinating is the fact that few South Africans or Capetonians know that there was a time when Cape Town was known as "Cape Grab". This was because of the grabbing practices of certain innkeepers in the old days in charging exorbitantly for board and lodging to sailors who passed by the Cape on their way to the East. Our wonderful mountain has many little interesting facts that it holds within its rock base. Here are some of them: These days we see Table Mountain floodlit by night and simply take the lighting for granted, but do you know when the mountain was lit up for the very first time? The answer to this is in 1947. The occasion was the Royal visit. Another occasion when the mountain was then lit up once more was during the Van Riebeek Festival in 1952. Most Capetonians who love their city know that the first man to ascend Table Mountain was the Portuguese navigator and soldier Antonio da Saldanha. He accomplished the feat in 1503. This leads to the question of who was the first woman to ascend the mountain and when did this take place? The answer to this is not documented as an individual but as a group of women who were in the company of Governer Simon van der Stel in 1680. To commemorate the event a pile of stones was heaped up on the top of the mountain. Did you know that the first man to ascend Table Mountain on horseback was General Sir James Craig who accomplished the feat in 1818. Not to be outdone J. A.P.Cartwright also ascended the mountain in 1930 in a rather novel way to record a first in that he got to the top in a Baby Austin motor vehicle. There are photographs available to prove this feat. Let it however be told that the car had to be lifted almost bodily over some of the bad terrain. Selwyn Davidowitz is an accredited SATOUR tourguide/operator who is extremely passionate about the city of Cape Town as well as his country South Africa.